Fast Track: EMS Fitness, Toning, Strength & Injury Rehab Centres. Electro Muscle Stimulation (EMS fitness) is a scientifically proven training method which has been used for decades globally in medical and rehabilitation fields. It was introduced in the 70’s for sports training and was recognised as a legal training method for the 1972 Olympics. EMS fitness has seen significant growth in its current form as a toning, strengthening and fitness tool since 2003. It can also be very effective for helping to overcome back pain and knee injuries, as well as having benefits for asthma & emphysema sufferers *. EMS works by contracting your muscles via an electrical current. 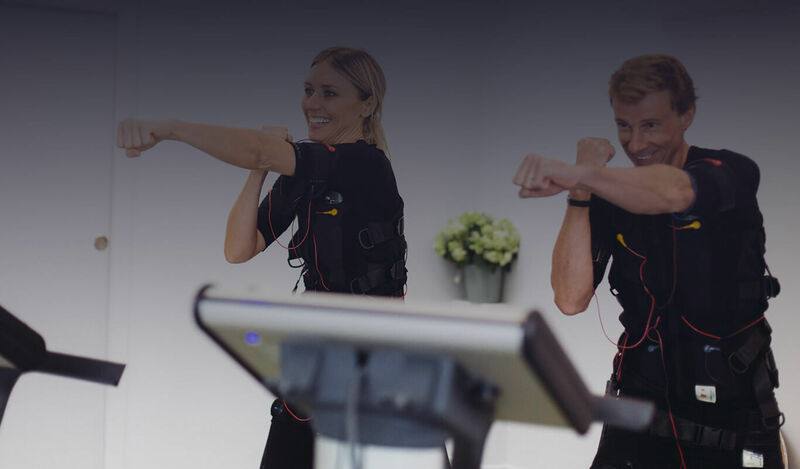 A specially designed vest and belt, which has a sensor for all your key muscle groups, is connected to our Miha Bodytec EMS machine. More than 90% of your muscles are engaged – 20 minutes can bring the same results as a 90 minute gym session. There is no major strain on your muscles – so it is safe and injury free. A trial EMS session at Fast Track is completely free and is the perfect way to understand how this technology can help everyone achieve their fitness goals in just 20 minutes a week. Come and try EMS at Fast Track now! CLICK HERE TO VIEW FAST TRACK’S WINCHESTER VENUES.